Boston, MA - 12 September, 2017 -- Digital teams should replace outdated, waterfall-based approaches to technology selection with a more agile and adaptive process better suited to modern enterprise environments, according to book authors Tony Byrne and Jarrod Gingras. 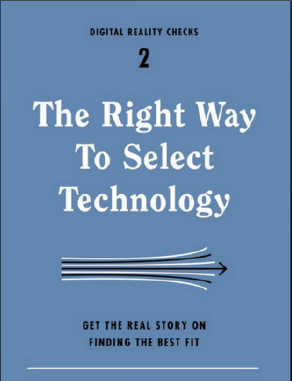 The Right Way to Select Technology: The Real Story on Finding the Best Fit was published this week by Rosenfeld Media. The book takes an enterprise selection team through an adaptive process for aligning business and technology needs, then explains how to rapidly find the right solutions through story-based, hands-on testing. See Rosenfeld Media for details. Authors Byrne and Gingras are founder and managing director respectively of Real Story Group, an exclusively customer-focused technology analyst firm. Real Story Group is a uniquely “buy side” analyst firm, working solely for solutions buyers and never for vendors. We provide research and advisory services to help customers select and optimize the right digital workplace and marketing technologies. RSG evaluates Web Content & Experience Management, Digital Asset Management, ECM, Enterprise Collaboration, Portals, Office 365, CRM, CDPs, and Marketing Automation & Campaign/Lead Management Technologies.